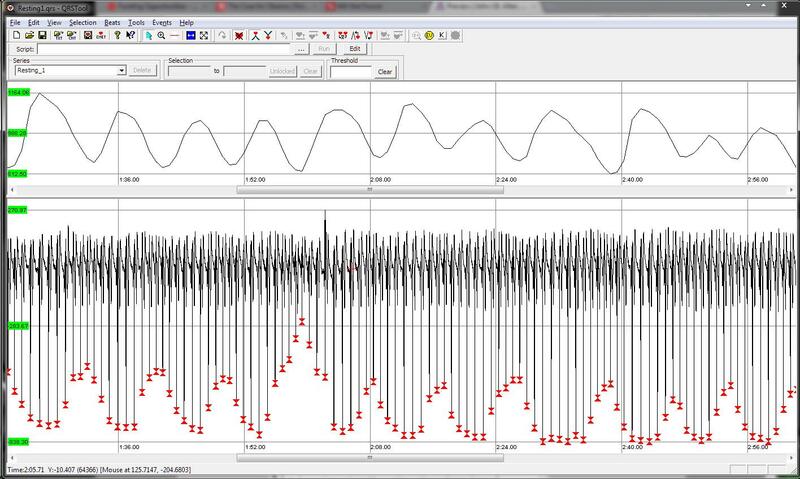 QRSTool and CMetX Software for Calculating Metrics of Cardiac Variability | John J.B. Allen, Ph.D.
Software for calculating several of the more popular metrics of cardiac variability that can be derived from a single electrocardiographic channel is available here. QRSTool was written by David Towers. QRSTool provides a graphical user interface (see screenshot) that will allow for the extraction of the IBI series from EKG data, whereas CMetX (written by John Allen) is a command-line based utility that will calculate several metrics of cardiac chronotropy given a simple IBI series as input. The tools are integrated such that users who choose to extract the IBI series with QRSTool can have metrics calculated directly by CMetX. The programs also can be used independently: CMetX can derive metrics given any IBI series as input, and QRSTool can extract the IBI series to then analyze using other programs or algorithms. QRSTool can read an EKG signal stored as ASCII text, or import directly from Neuroscan's CNT format. CMetX requires as input an ASCII file that contains an interbeat-interval series, with one IBI per row. CMetX runs in a DOS environment under any version of Windows. A Quick-Start Pragmatic Guide is avaiable for download (pdf), and help menus in QRSTool are also fairly extensive. From a DOS prompt, typing CMetX with no other parameters will bring up informational screens. A series of video tutorials is also available, covering importing and visualizing data in QRSTool, methods for identifying R-Spikes, and deriving metrics of cardiac variablity in CMetX. Allen, J.J.B., Chambers, A.S., & Towers, D.N. (2007). The many metrics of cardiac chronotropy: A pragmatic primer and a brief comparison of metrics. Biological Psychology, 74, 243-262. Allen J.J.B. (2002). Calculating metrics of cardiac chronotropy: A pragmatic overview. Psychophysiology, 39, S18.